Play is one of the key ways in which children learn and develop socially, physically, and behaviorally by building self-worth and giving a child a sense of their own abilities. Because play is fun, children often become very absorbed in what they are doing, which helps them develop the ability to concentrate. The different types of play such as pretend, constructive, and cooperative play builds your child's creativity and imagination and also allows children to relax, develop social skills such as cooperation, develops motor skills, and teaches self-expression. For example, whether she’s rolling a ball back and forth with a sibling or putting on a costume and imagining she's an astronaut—she's developing important social skills such as taking turns, cooperation, and getting along with others. 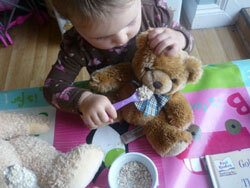 Furthermore, providing opportunities to engage in different types of play will help her learn in numerous other ways. Parents are their children’s first and best playmates and therefore have a role in being actively involved in their children’s play. Children are more creative when their parents are involved in their play and the best play occurs when the adult plays alongside the child, rather than just providing the toys or supervising. Becoming part of a child’s play may take practice but is beneficial for all parties involved! Parents are their children’s first and best playmates and therefore have a role in being actively involved in their children’s play. Children are more creative when their parents are involved in their play and the best play occurs when the adult plays alongside the child, rather than just providing the toys or supervising. Furthermore, providing opportunities to engage in different types of play will help her learn in numerous other ways. Becoming part of a child’s play may take practice but is beneficial for all parties involved! Unoccupied Play refers when a child actually isn't playing at all. He may be engaged in seemingly random movements, with no objective. Despite appearances, this definitely is play and sets the stage for future play exploration. Solitary Play is when your child plays alone. Important because it teaches a child how to keep himself entertained, eventually setting the path to being self-sufficient. Any child can play independently, but most common in children around ages 2-3 because they are still pretty self-centered and lack good communication skills. Onlooker Play is when a child simply observes other children playing and doesn't partake in the action. It's common for younger children who are working on their developing vocabulary. 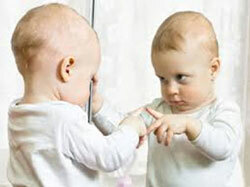 Don't worry if your little one is behaving this way. It could be that the child feels shy, needs to learn the rules, or maybe is the youngest and wants just to take a step back for a while. Parallel Play then emerges and it is best to imagine children having fun, playing side by side in their own little world. It doesn't mean that they don't like one another, they are just engaging in parallel play. Despite little social contact, children who parallel play learn quite a bit from one another like taking turns and other social niceties. Even though it appears they aren't paying attention to each other, they are and often mimic the other one's behavior. This type of play is an important bridge to the later stages of play. Associative Play also features children playing separately from one another. However, they are involved with what the others are doing—think children building a city with blocks. As they build their individual buildings, they are talking to one another and engaging each other. This helps little ones develop many skills—socialization (what should we build now? ), problem-solving (how can we make this city bigger? ), cooperation, and language development. Associative play is how children begin to make real friendships. Lastly, is cooperative play and is where all the stages come together and children truly start playing together. Common in younger preschoolers who have older siblings or have been around a lot of children. Cooperative play uses all of the social skills your child has been working on and puts them into action. Whether building a puzzle together, playing a board game, or enjoying an outdoor group game, cooperative play sets the stage for future interactions as your child matures into an adult. Research has shown for years that play is an important part of a child’s day. It is where they learn to work cooperatively, expand their vocabulary, bring their imaginations to life, reinforce math skills and encourage teamwork. Children who use their imagination and ‘play pretend’ in safe environments are able to learn about their emotions, what interests them, and how to adapt to situations. When children play with each other, they are given the opportunity to learn how to interact with others and behave in various social situations. It is exciting to see the different stages demonstrated in our children as they grow into cooperative play and more detailed imaginative play the older they get! Because play is closely tied to the cognitive, socio-emotional, and motor development of young children, it should be an important part of their early lives. Rowan Professor Karen Hutchison talks about the importance of play for young children. Society's well-being begins with a child's well-being, and play is central to a child's ability to grow into a productive adult. Play is how children learn to communicate, problem solve, test ideas, and get along with others. Play is an activity that is fun, spontaneous, and open-ended. There are many different types of play, including outdoor play, ‘rough and tumble' play, pretend play, solitary play and the main ingredient for all of them is imagination. Research shows play stimulates healthy brain development as observed by strong links between creative play and language, physical, social/emotional, and cognitive development (play helps to develop the “whole” child). During play, children learn about the world in which they live, they can explore, create, imagine and figure things out! Additionally, play is a powerful tool for building self-control and self-regulation which has been shown to be a predictor of optimal early learning and future success in life. Play can be loud or quiet, active or passive, with groups or alone. Of course, children love to play with other children but there are also types of play. For example, - “Onlooker play” happens when a child watches other children at play, perhaps looking at an opportunity to join in or just getting to know how other children play. Play can be quite serious, as in the construction of an intricate block building, or it can be silly like banging on the pots and pans to make a “beautiful” noise. Why do children want to play? Play is done for its own sake – not for a reward of any kind or because one is directed to do it. Although children learn through play – they don't necessarily play to learn. They play because they want to and because it is interesting, challenging and fun. Also, for children there is no division between learning and play; between the things that are educational and things that are fun. The child learns while living and any part of that living is also play. How does play help my child learn? Play nurtures the development of skills such as literacy and numeracy in ways that are meaningful to the child, develops good interpersonal skills, and helps children learn to problem-solve, negotiate conflicts and think for themselves. When children play they integrate all types of learning and development, such as, When children draw pictures they are learning to use symbols to represent their ideas, which is a necessary skill for learning to read and write; When children pretend-play together, they are improving their language skills, social skills, and they are developing an understanding of social expectations, including empathy, and the list goes on! Children already play, don't they? There has been a consistent decline over recent years for children to have opportunities for unstructured play. Many children are engaged in adult-directed, scheduled activities (sports, music, dance) and have very little downtime to spend “just playing” by using their imagination such as building forts and playing outside. Screen time” (e.g., cartoons, DVDs, computers, electronic games) starting at an early age means that more time is spent in front of a screen than engaged in physical or imaginative play. Increased attention to academics has also reduced the opportunities children have for play. How can I incorporate play into my busy day? Many competing demands find most parents at a loss for ways to build play time into their child's day. Play can be built into everyday routines and activities. For example, you can play I Spy in the car, have a picnic in the backyard, cook a cake or dinner together, matching games while grocery shopping (waffles with syrup), sing songs, read books at bedtime in silly voices, create scavenger hunt for finding pajamas, bath toys during bath time, play games like basketball or sing clean-up songs while cleaning up toys, etc. How can I support my child's play? Play is very important for children's development and parents play an important role as they are their child's best teacher. Therefore, make play a priority in the home by building time play into children's day together, but also allow time for freedom to engage in unstructured play. Parents can learn so much about their children's play strengths and needs by watching them play – do they take turns, follow instructions, play with other children? Parents can support children's play by providing appropriate play materials, structuring their environment to encourage play, and introducing new types of play to their children when developmentally appropriate. Description: Hold your grandbaby in your arms in front of the mirror. Talk about and point to his body parts—eyes, nose, mouth, arms, etc. Then step away from the mirror and ask, “Where did baby go?” Move back in front of the mirror and say, “There’s the baby!” Hide-and-seek games enhance babies’ growing sense of body awareness—the knowledge that they are separate from you. Description: Sing songs with your grandchild that have hand motions that go along with the lyrics. For example, songs and rhymes like “Patty Cake,” “Twinkle, Twinkle Little Star,” “Wheels on the Bus,” and “Where Is Thumbkin” all have hand and finger motions to do as you sing. When your grandchild is able to use his hands and fingers, he will start to copy your gestures and—before you know it—he will be singing along! Description: Gather several pieces of material with different textures—such as a tea towel, fake fur, felt, a silky scarf. Holding your grandbaby upright (with hands under baby’s arms), let her feet touch one of the fabrics. (Or allow crawling babies to crawl on and over the fabric.) Try a few different fabrics to see which textures your grandchild seems to prefer. 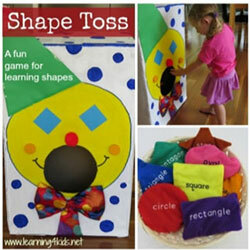 Games like this enhance a baby’s sensory and body awareness. Description: Children learn a myriad of things from playing games and this simple game proves that by helping with: Gross Motor Development and Fundamental Movement Skills, Hand-Eye Coordination and Control, Cause and Effect, Concentration, Spatial awareness – experimenting with shape and space, Language development – shape names, and Pride and sense of achievement. Description: Closer to age 2, a very big step in the child’s thinking skills develops the ability to use his imagination. This means that he can create new ideas and understand symbols. For example, he offers his bear his cup showing he understands that the stuffed bear is a stand in for a real bear who can eat. His ability to use his imagination in action as he goes from using objects in they way they are intended to be used–a comb for combing hair–to using them in new, creative ways. The comb might become a toothbrush for a stuffed animal. Symbolic thinking skills are critical for learning to read as well as for understanding math concepts. 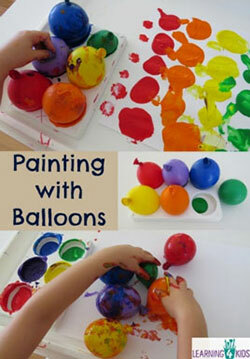 Description: What you can do: Play pretend with your toddler. You might say: “Bear loves it when you cuddle him. Do you think he’s hungry?” Then bring out some pretend food. Provide props. Offer your child objects to play with that will help him use his imagination: dress-up clothes, animal figures, dolls, pretend food. 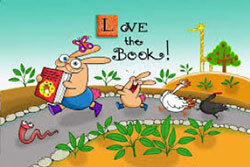 Description: Before you read a new book, take a “picture walk” with your grandchild and look at the illustrations first. See if your grandchild might want to tell you the story just using the pictures as a guide. This type of activity helps your grandchild develop her vocabulary, build creativity, and put actions in their logical order. 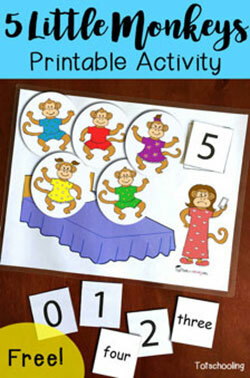 Description: 5 Little Monkeys activity is a great printout activity for counting, number recognition, and one-to-one correspondence. It also comes with number words for children learning to read. 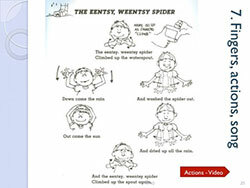 In addition, you can play the song along and read the book for more association. 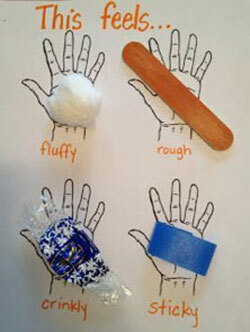 Shakers: What does a child experience with this simple activity? Description: A sense of pride and self-worth as they explore a new skill and express themselves creatively. They are strengthening their fine motor muscles, control and coordination. They are using their thinking and reasoning skills to problem solve while also communicating and using descriptive language. 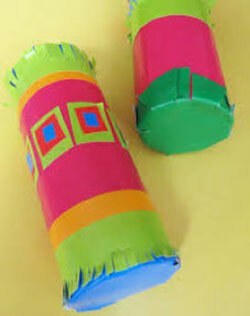 In addition, children playing with shaker are learning about music and recognizing different sounds. Lastly, they are counting and naming the colors of beans, rice, pasta, etc.. Description: The most effective sources of early learning are immediate, meaningful, and involve children’s discovery and choice. 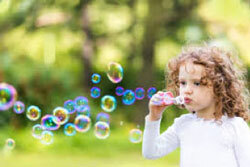 Bubbles not only involve children in learning, but they are fun, easy to use, and ever-changing. In addition, many science processes such as, investigation, discovery, experimentation, observation, definition, comparison, and classification can be learned simply by playing with bubbles. Bubbles help children develop self-concept as they learn about themselves and the world around them, and language development is enhanced when children learn new words to describe bubbles, explain tasks, and label and record bubble experiments.